First of all, let’s clear the air. Spike lug nuts are legal. They don’t look like they should be, but they’re less likely to get you pulled over than that window tint you’re considering. They come in all sizes, materials, and colors, and if you can ride it, you can fit spikes on it. ATVs are all about adventure, but customizing them to reflect your wild side is a pain. Paint jobs and body mods cost a pretty penny. What hurts more than the initial payout is the fact that all that custom work probably won’t survive more than a few trips around your favorite off-road track. ATVs are built tough, and they often survive dramatic flips, rolls, and slides without any serious damage. Cosmetics, of course, are another story entirely. 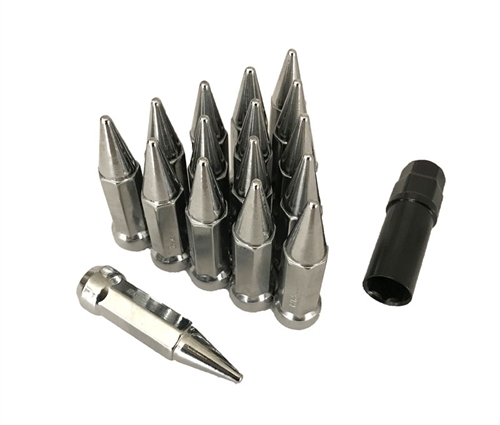 Spike lug nuts offer a practical way to add some style to your ATV. Extra work on the body of an ATV, usually looks like the owner is trying too hard. You want to avoid this. However, your ATV actually needs lug nuts, though, and these understated accessories add a sharp bit of style that stands out of the crowd. They’re available in a range of materials and colors to match any wheels, and unlike that pretty paint job, they can actually stand up to everything you have to throw at them. Cars and trucks face strict appearance and modification policing. A lot of the most interesting additions aren’t legal, at least not for driving on the street. Unless you plan to tow your beautiful work of art everywhere, you’ll have to think outside the box. Again, this is where spike lug nuts come into play. While they look like some wicked device from a Roman chariot race, spike lug nuts are entirely legal and perfectly safe. They reflect the attitude of your car. They don’t make it a killer. Another factor to consider about spike lug nuts is the price. You can light up your undercarriage and invest in chrome everything, but only if you have the budget. Chances are, even after you’ve gone through all the cost and effort of making your car a one-of-a-kind custom ride, it will still turn out looking like some other guy’s toy. The market is only just now waking up to the advantage of spike lug nuts. Most people just assume they’re illegal because they look dangerous, but they’re perfectly legal and still surprisingly unique. Best of all, spike lug nuts add a certain flair to your car or truck that you just can’t get from most popular modifications. They’re simple, they don’t interfere with your vehicle’s overall shape and design, and they’re actually useful. Gilding the lily is always a disaster, and who wants a pretty paint job when you can turn your car into something straight out of a post-apocalyptic thriller? Spike lug nuts are legal, but you don’t have to tell anyone except the cops. You can enjoy everyone else’s double-takes. Whether you want to buff up your ATV, car, or truck, the right spikes are waiting.